Welcome to Americas Best Value Inn and Suites Cheyenne; conveniently located as the first hotel off of I-25 exit 9. We are less than four miles from the Cheyenne Regional Airport. Cheyenne-known as -The Magic City of the Plains- is also the unofficial rodeo and railroad capital of the United States. Cheyenne is home to both the famous Cheyenne Frontier Days- July 22-31-the worlds largest outdoor rodeo- and Big Boy- the worlds largest steam engine. We invite our guests to enjoy our free hot continental breakfast and coffee in our lobby. Stay connected with free wireless high-speed Internet access in our common areas and guest rooms. Step into the privacy of your newly renovated guest room with amenities including cable TV with HBO and ESPN- desk with lamp- clock radio- free local calls- and wake-up service. A mini-fridge- iron- ironing board- and hairdryer are available upon request. 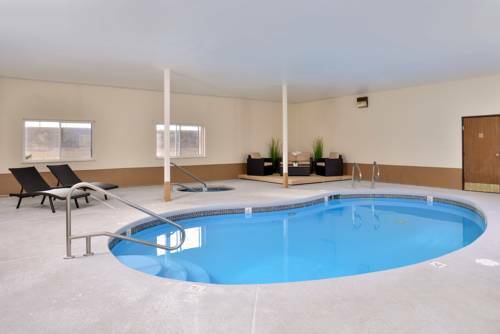 Take a swim in our indoor chemical-free salt water pool and jacuzzi. Children age 12 and younger stay free in their parents room with existing bedding. Call hotel directly for pet policy and restrictions. Please call ahead to make sure rooms that allow pets are available. Our Cheyenne- WY hotel is situated near Curt Gowdy State Park- Vedauwoo Recreation Park- and Medicine Bow National Forest. We are also close to Cheyenne Depot Museum- Cheyenne Botanic Gardens- Wyoming State Capitol- Historic Governors- Mansion- Cheyenne Civic Center- and Cheyenne Symphony Orchestra. Check out a flick at Atlas Theatre and Lincoln Movie Theaters. Shop at Frontier Mall and Cheyenne Farmer-s Market. Enjoy a tasty meal at one of the local restaurants such as Village Inn- Crossroads Cafe- or Outback Steakhouse. At Americas Best Value Inn and Suites Cheyenne- We-ve Got You Covered from the time you hit the road until your head hits the pillow. Americas Best Value Inn and Suites Cheyenne conveniently located as the first hotel off of I-25 exit 9. Our address is 2512 West Lincolnway- Cheyenne- WY 82001. Abe's monumental gleaming head looks down from the highest point of the old Lincoln Highway.